The snow crunched under his boots with each step as Yun pushed towards the summit ridge. Around him the Himalayas stretched out in jagged white peaks and valleys. At nearly 30,000 feet— the cruising altitude of a commercial airliner—he was high enough to see wisps of clouds drifting below him. It was 8am on May 18th, 2018 and Yun had reached the roof of the world, the summit of Everest. The weather was mild enough for Yun to wear his lighter weight gloves, giving him more dexterity as he pulled a piece of cloth from his jacket pocket. Like astronauts planting a flag on the moon, climbers often carry their country’s national flag to the summit with them. Yun’s flag, however, was not the red with gold stars of his native China, nor the red, white, and blue of the U.S.A., his current home. Here in his precious minutes at the top of the world, Yun unfurled a small white banner…across the front it said Wildlife Conservation Network. 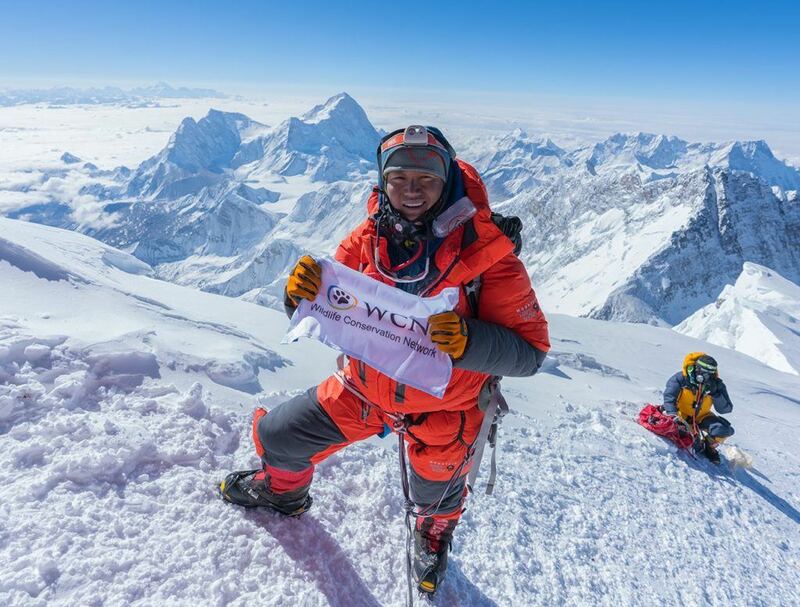 The WCN staff were delighted when Yun surprised us with a photo of himself at the top of Everest holding a flag embossed with our organization’s logo and name. There are many worthy organizations he could have emphasized in that once-in-a-lifetime moment, but Yun felt a connection with WCN; specifically, the heartfelt community we have created connecting conservationists with each other and with supporters, our specific focus on endangered species protection, and our financial efficiency. We are honored that Yun included us in this deeply meaningful milestone. Wildlife conservation is not a small issue. It’s global, complex, often dangerous, and requires an unrelenting optimism to succeed. Hopeful stories and heroic deeds can help fuel that optimism; Yun’s story demonstrates what strong focus and commitment can accomplish. Consider for a moment, what Yun did to reach the summit of Earth’s tallest mountain: for seven years he has traveled the world climbing peaks that ranged from 3,000 to 26,000 feet, building his mental and physical strength and stamina. His serious training for Everest took a year—wherein he logged 420 hours of training with over 180,000 feet of elevation gained, all with a 40lb. backpack strapped to him and full time 9-5 job. His Everest expedition took about two months; he started in early April, spent weeks acclimating to the altitude and waiting for the right window of good weather to open, finally summiting on May 18th, a feat which took 10 hours…and all this before the most dangerous part, getting back down. Yun’s experience climbing Mt Everest is a reminder that our natural world is both powerful and fragile and demonstrates that we can accomplish what seems impossible. As Yun explained it, “I got the chance to look deep into my soul, through fear and weakness. At the end, on the summit, peace emerges, from knowing that I have done something I thought was impossible, and now, anything is possible.” It’s an achievement that makes me think of the field based wildlife conservationists who sacrifice so much to keep our planet beautiful, healthy, and full of life. They too are making the impossible possible. As I write this from my comfortable chair in my warm office here at sea level, I am moved by Yun’s message that we must save our planet and inspired by all those who are fighting to make that happen.